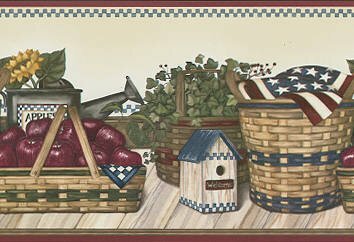 This patriotic wallpaper border has perfectly pretty border design - it is decorated with vintage American symbols, which helps to take room's style and appearance to the next level! EXTREMELY HIGH QUALITY - our decorative wall border is of perfect quality, made using only finest materials and excellent manufacturing practices, making this border wallpaper long lasting. Easy to install and DIY - the border is prepasted and strippable. WASHABLE - this wallpaper border is washable so you can always ensure perfect look of your walls because they can easily be cleaned . BRINGS EXCITING NEW LOOK TO THE WALLS - these excellent wallpaper borders bring color, character and stylish detail to a room with exciting new look for your walls. DECORATED IN PATRIOTIC pattern - this patriotic wallpaper border has a perfectly pretty border design - it is decorated with classic symbols from Forefathers' times, which helps to take room's style and appearance to the next level!